Sorting of antigen-specific T cells to high purity using the MACSQuant Tyto Sorter. 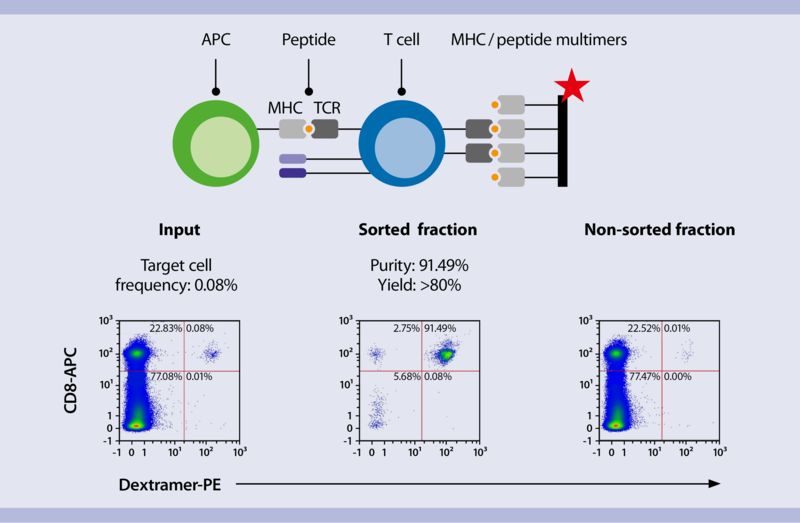 In this FDA-approved clinical phase II study, peptide-MHC-multimers were used to detect and sort a rare subset of antigen-specific T cells out of PBMCs using the MACSQuant Tyto Sorter. The closed cartridge system facilitates contamination-free cultivation and expansion of these cells after sorting. Sorting of antigen-specific T cells to high purity using the MACSQuant Tyto Sorter. In this study MHC multimers were loaded with a melanoma-specific peptide to detect and sort antigen-specific T cells. The peptide loaded on the MHC multimer binds to T cell receptors specific for this peptide/MHC combination. The objective of this study was to isolate T cells specific for this melanoma antigen from PBMCs, followed by in vitro expansion and adoptive cell transfer. Antigen-specific T cells were sorted on the MACSQuant Tyto with a purity of 91.49%. Sorting of pre-enriched regulatory T cells to high purity using the MACSQuant Tyto Sorter. In this study, the CliniMACS Prodigy® was used for immunomagnetic and fluorescent labeling and cell isolation in order to pre-enrich white blood cells obtained via leukapheresis. Subsequently, cells were sorted on the MACSQuant Tyto. Combining these closed-system instruments guarantees full sterility of your medical product. Sorting of pre-enriched regulatory T cells to high purity using the MACSQuant Tyto Sorter. In this study, the CliniMACS Prodigy® System was used for immunomagnetic and fluorescent labeling of and pre-enrichment according to the CD25 marker. Subsequently, the pre-enriched and labeled cells were transferred into the MACSQuant Tyto Cartridge and sorted on the MACSQuant Tyto based on the CD4+/CD25+/CD127lo/- phenotype. These data show the input and positive fraction of the sort. Since pre-enrichment was performed on the CliniMACS Prodigy System, target cell frequency increased to 24% in the input. An initial debulking step was performed to decrease overall sorting time. Subsequently, the cells were sorted to high purity of 96%. Subsequent sorting of PBMC-derived B cells, T cells, and NK cells to high purity using the MACSQuant Tyto Sorter. Unlike conventional droplet sorters, sorting on the MACSQuant Tyto allows for retrieval of the negative population and permits subsequent sorting of functionally different cell populations out of one single population of cells. In this study, B cells, T cells and NK cells were subsequently sorted out of one population of PBMCs without affecting cell viability. Subsequent sorting of PBMC-derived B cells, T cells and NK cells to high purity using the MACSQuant Tyto Sorter. 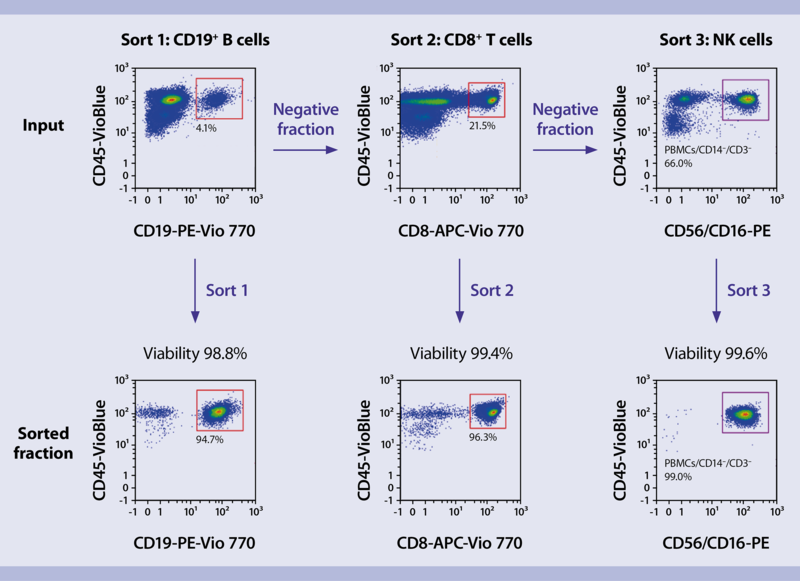 In this experiment three different subpopulations were subsequently sorted out of one population of PBMCs, starting with CD19+ B cells for the first sort. The negative fraction was used as input for a subsequent second sort, enriching CD8+ cytotoxic T cells. In the third sort, the negative fraction of the second sort was used as input to sort for CD56+/CD16+ NK cells. Sorting sessions lasted around on hour each. All fractions showed viabilities greater than 98%, even after three subsequent sorting rounds. Sorting of neutrophils to high purity using the MACSQuant Tyto Sorter. Neutrophil granulocytes are very sensitive towards environmental changes like mechanical stress, temperature changes, and other factors. Therefore, gentle isolation is a critical step for accurate analysis of their function. Sorting of neutrophils to high purity using the MACSQuant Tyto Sorter. In this study, 1.5 to 2 mL of heparinized whole blood was labeled with antibody conjugates against CD45 and CD16. After washing, the blood was diluted by a factor of 4–10 with MACSQuant Tyto Running Buffer. Neutrophil granulocytes were sorted to 97.7% purity with 98% viability using the MACSQuant Tyto. The neutrophil granulocytes were cultivated at 37 °C for 4 hours to evaluate expression of the activation marker CD11b and naïve marker CD62L. Cells stimulated with the chemotactic peptide formyl-methionyl-leucyl-phenylalanine (fMLP) served as a positive control. No significant differences in activation status were observed between the sorted fractions and the negative control confirming the gentleness of MACSQuant Tyto cell sorting. Sorting of different NK cell populations from one starting material using the MACSQuant Tyto Sorter. Due to the unique cartridge design, the MACSQuant Tyto Sorter allows for a completely sterile recovery of the negative fraction after the sort process. In addition to the prevailing gentle sorting conditions, this permits subsequent sorts from one and the same starting sample. In this study, the two major subtypes of NK cells present in human blood were subsequently sorted out of one population of peripheral blood mononuclear cells (PBMCs) without affecting cell viability. Sorting of NK cells to high purity using the MACSQuant Tyto Sorter. 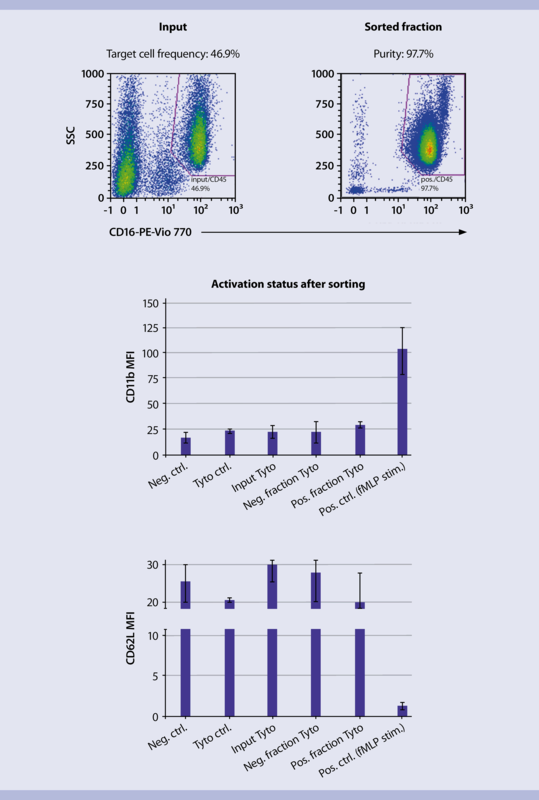 In this experiment, two different NK cell subpopulations were sorted out of one population of human PBMCs, starting with regulatory NK cells (CD56hiCD16–) with a target cell frequency of 0.31%. The negative fraction was used as input for a subsequent second sort, enriching classical CD56+CD16+ NK cells. 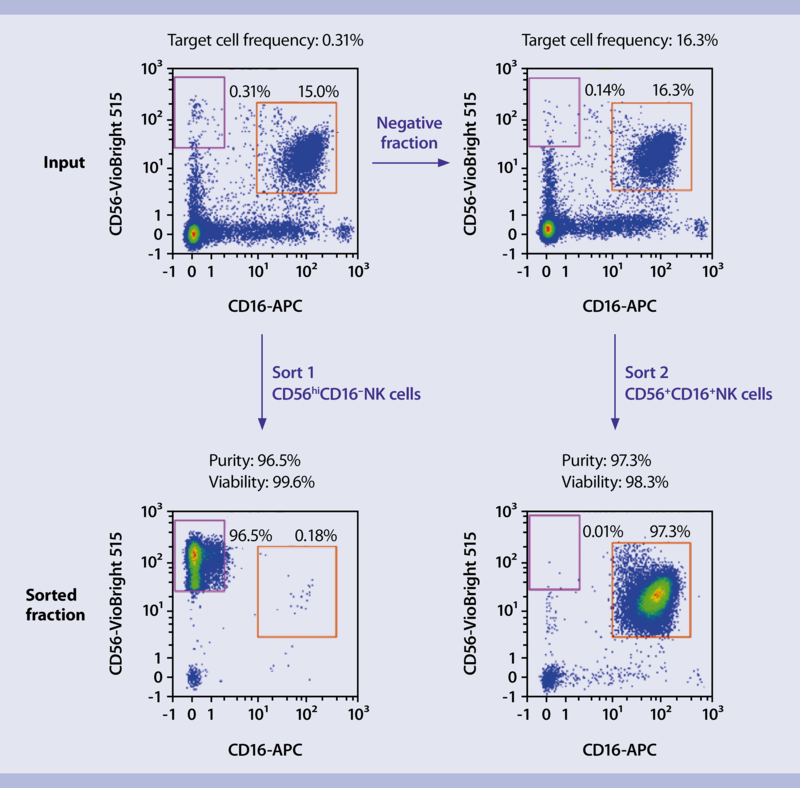 Both sorting steps resulted in highly pure target cell populations with viabilities above 98%. Sorting of iPSCs to high purity using the MACSQuant Tyto Sorter. GFP-positive IPSCs were sorted using the MACSQuant Tyto, then replated and cultured for 24 hours. When compared to controls, GFP-positive IPSCs showed comparable replating efficiencies, highlighting the gentle nature of sorting with the MACSQuant Tyto. Subsequently these cells where differentiated into cardiomyocytes and sorted to 98% purity. After replating, cardiomyocytes started contracting within 24–48 hours, confirming functionality of cells. Sorting of iPSCs to high purity using the MACSQuant Tyto Sorter. In this experiment GFP+ iPSCs were sorted on the MACSQuant Tyto to a purity of 97.4% from a starting frequency of 20.6% based on the GFP marker. GFP+ iPSCs were replated and cultured for 24 hours. Compared to controls, no significant differences were found in relative replating efficiency between sorted cells and controls. Sorting of mesenchymal stem cells to high purity using the MACSQuant Tyto Sorter. Due to the gentle sorting conditions and because all cells remain in the cartridge after each sort, sequential sorting can be applied to enrich rare cells in a two-step sorting strategy. In this study bone marrow derived mesenchymal stem cells were sorted to high purity in a sequential sorting strategy using the MACSQuant Tyto. Sorting of CD133+ cells to high purity using the MACSQuant Tyto Sorter. 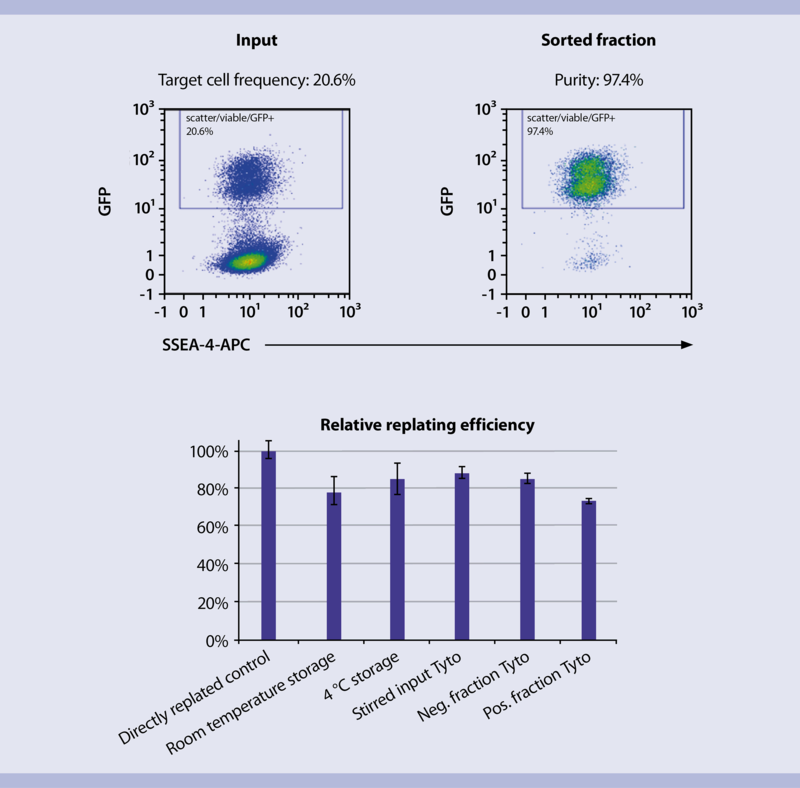 Gentle sorting conditions and a completely sterile cartridge system, in which cells remain at all times, allow for efficient enrichment of rare cells on the MACSQuant Tyto Sorter, e.g., by using a two-step sorting strategy. In this experiment, rare CD133+ cells were sorted from frozen cord blood MNCs. The positive fraction of the first sort was used as input for a second sort, yielding a highly pure cell population. Sorting of CD133+ cells to high purity using the MACSQuant Tyto Sorter. In this experiment, rare CD133+ cells were sorted from frozen cord blood mononuclear cells (MNCs) using the MACSQuant Tyto Sorter. Sorting was performed based on CD34 and CD133 expression on CD45+ cells using a two-step strategy. The different fractions were analyzed using a MACSQuant Analyzer 10 before (input), after the first (sorted fraction #1), and after the second sort (sorted fraction #2). After the first sort, CD133+ cells were enriched from a 0.74% frequency in the original fraction to a purity of 61.21%. A subsequent sorting step on the same population increased purity to 99.03%, demonstrating that the MACSQuant Tyto Sorter is suitable for sorting rare cell populations to high purity. Sorting of yeast cells to high purity using the MACSQuant Tyto Sorter. Due to the closed cartridge system, the MACSQuant Tyto allows for completely safe sorting of hazardous cell material, such as bacteria, yeast or potentially contaminated cells. In this experiment, GFP-positive yeast cells were sonicated and sorted to high purity without affecting viability. On the MACSQuant Tyto Sorter subsequent experiments can directly be executed without a labor-intensive cleaning routine or risk for persistent contamination of your sorter. Sorting of yeast cells to high purity using the MACSQuant Tyto Sorter. In this study, a sonicated 21.5% GFP+ spiked-in Pichia Pastoris yeast population was sorted to determine the effect of MACSQuant Tyto Sorting on yeast cell growth. First, yeast cells were sonicated to break up yeast clusters. Subsequently, GFP+ yeast cells were sorted to 93.8% purity and cultured. A comparison in cell growth rate was made between the wildtype yeast population, a pure GFP+ population, a spiked in mixed population and the sorted GFP+ positive cells. All pupulations were cultured for 19 hours. Data shows that the growth rate of the wildtype yeast population is lower than that of the GFP+ population. 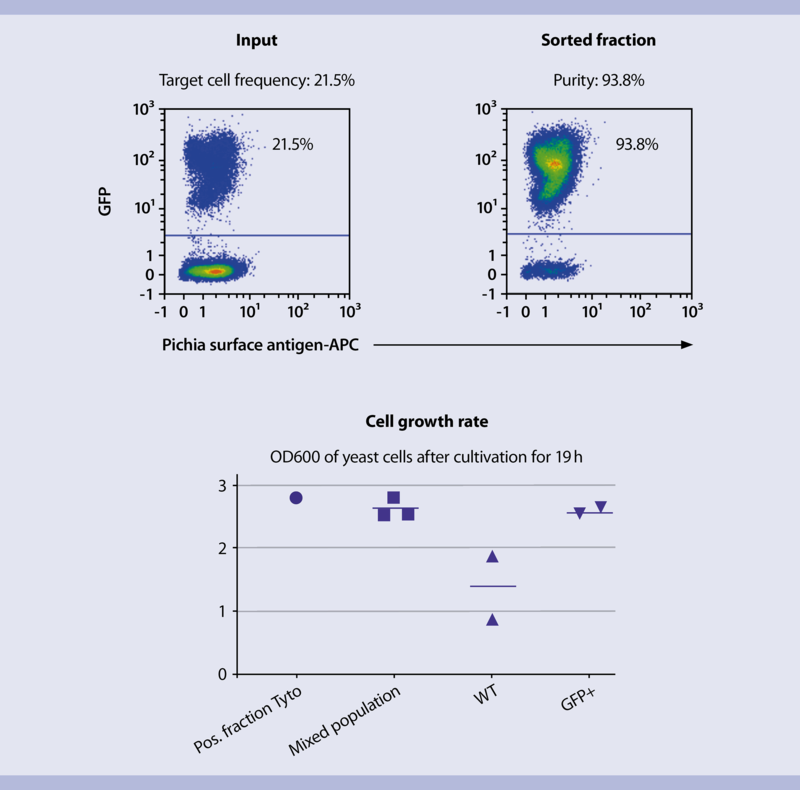 The mixed population and sorted cells show a comparable growth rate, indicating that sorting on the MACSQuant Tyto does not affect growth of yeast cells. Sorting of GFP+ bacteria to high purity using the MACSQuant Tyto Sorter. This experiment provides a proof of principal for safe sorting of very small (E. coli diameter ≈ 1µm, length ≈ 2µm), high-risk material using the MACSQuant Tyto Sorter. GFP-expressing bacteria (E. coli) were sorted from a mixture with wildtype bacteria, resulting in a sort purity of 97%. Sorting of bacteria to high purity using the MACSQuant Tyto Sorter. In this experiment, a mixture of wildtype and GFP-expressing bacteria (E. coli) was sorted using the MACSQuant Tyto Sorter in order to enrich for the GFP+ population. The different fractions were analyzed using a MACSQuant Analyzer 10 before (input) and after (sorted fraction) the sorting process. GFP+ E. coli with a starting frequency of 37% were sorted to 97% purity.